We spend half our lives being told we’re not good enough by teachers and parents and ads and bad boyfriends. No wonder we’re filled with such doubt when it comes to pulling up our big girl pants and stepping out into the world as we truly are, in all our beauty and power. Even writing this I feel like my stories aren’t dramatic enough to appeal to anyone. But life doesn’t have to be dramatic to be meaningful. My former husband spent a lot of time letting me know I wasn’t good enough – not considerate enough or affectionate enough, not concerned enough with my appearance. When he came right out and said that he wouldn’t support me in my desire to pursue a dream of midwifery, I literally heard a tear in the fabric of our relationship. That was it for me, and terrifying though it was to have to tell our sons, I had no choice. I always got a kick out of self-help books. I was underlining quotes from the moment I first picked up The Road Less Travelled in the late 80s, but can’t say that I ever applied the theory to my life. As with everything I learned up until then, I read those books through a lens of studying concepts and ideas, that is, with my head. Around the time that my marriage was falling apart at the seams, I took up yoga. How novel for me – raised as a good Catholic to deny my body – and yet how right to follow a practice that drew me into my body, connecting it to my mind (not to mention my heart and soul). I went on a retreat where I randomly picked up a copy of Conscious Loving by Guy & Kathleen Hendricks. I was blown away to learn (yes, in a book) that our emotions are felt in the body. That one piece of knowledge woke me up to myself and sparked my transformation. My soul started crying out for something more. Subtle and faint though the message was, I mainly felt restless and dissatisfied, and knew something had to give. My marriage was part of what had to go. I have no recollection of what life was like when I first got divorced – I truly must have been in survival mode that first year. Once I resurfaced, all I could think about was finding another man. Even so, my dreams of doing something more with my life hadn’t gone away. I kept researching possibilities, even though midwifery had to be put on hold for a time, and found a small holistic health school. I immersed in a world of study, soul and community that my entire being had craved. I had found a new home for myself. Along with the nutritional and life sciences, I dove deep into self-exploration and learning esoteric modalities I’d only ever dabbled in as entertainment: chakras and Tarot cards and intuitive wisdom, homeopathy and flower essences rounded out my growing understanding of physiology and nutrients. Through my studies and experiences with life as it now looked, I learned that connecting what’s happening in your life to what’s happening in your body brings about the type of healing that goes well beyond getting rid of symptoms. Ironically, as I shifted how I cared for my body in an attempt to get allergies and sluggish digestion under control, I grew to be a weight I’d only ever been while 8 months pregnant. This bothered me much less than I would have thought, because at the same time I was alive in a way that I had never been. My mind was stimulated and challenged. I was living how I chose, from my values and needs and desires. 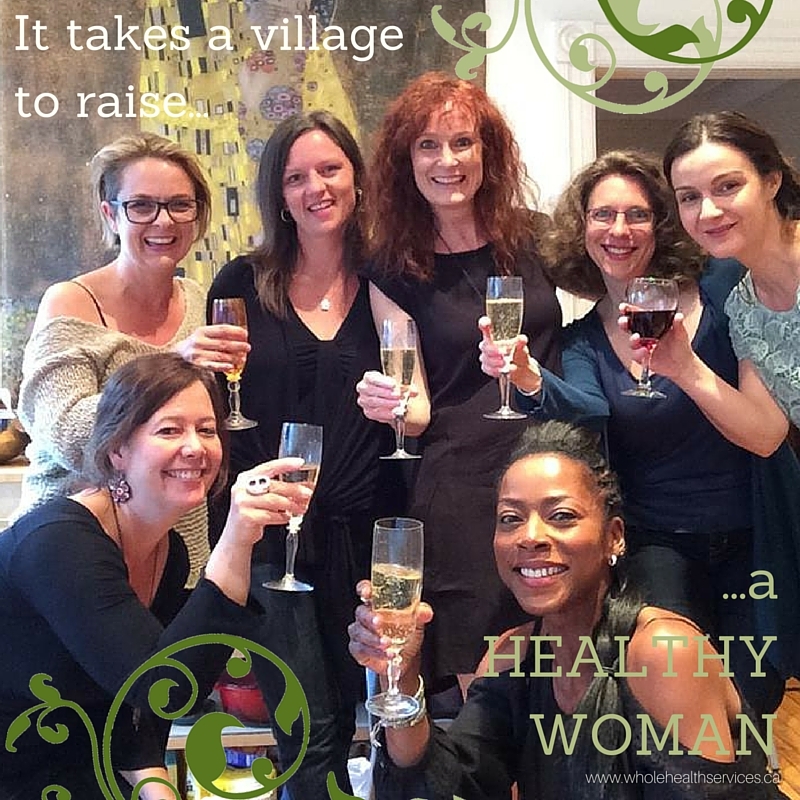 I grew closer to my kids, I grew closer to my friends, my colleagues were the sisters I never had, and I felt the strength of having the unconditional support of a posse of women. Even while I was looking for a man to fall in love with through those years, the truth is I was falling in love with myself. It’s only now, through 20-20 hindsight do I realize that the extra weight reflected the way I was growing into a whole person. Once the inner expansion came into full bloom, and I settled into this new way of being, it dropped off again. Women need to be seen and heard and loved for who they are so they can blossom in that love the way a flower responds to sunshine. You have a choice about how you live and how you care for yourself. It’s no one’s decision but your own – what you value and need and desire is enough. I hold a certificate in Holistic Nutrition Consultation (Naturotherapy) from NHC Institute in Montreal (2006). Teaching the same for 5 years (before the school closed in 2013) expanded on my understanding of physiology and nutrition and the fascinating way they weave together as part of the big picture of health. the Canadian Association of Natural Nutritional Practitioners. A deep curiosity and love of learning and self-exploration drove my pursuit of knowledge past the required anatomy, physiology and nutrition. Homeopathy, Therapeutic Touch, Flower Essences, Chakras, Tarot are a part of my tool kit – the more I learn, the better integrated I feel as a person and as a practitioner. Healer Heal Thyself: I am a work in progress as much as any one of my clients. I don’t propose that my own healing journey is anywhere near over…or perfect. Moving from Montreal to Ottawa for my husband’s work, in 2016, stretched my inner strength muscles that much further. My compassion and ability to hold space for others has only expanded through yet one more transition. I worked for 10 years as a Costume Designer and Costumière (1990-2000). I have a Certificate in Costume Studies from Dalhousie University, Halifax (1993) and BFA in Theatre Design from Concordia University, Montreal (1990). I enjoy whatever opportunity I have to dive back into the world of theatre production. In my former career, I helped people become someone other than themselves. Now, I help my clients to become who they are. Being out in Nature is a must; it’s how I charge my batteries. Hikes in the woods, puttering in the garden are a must. I can be found making snowmen, snow forts and snow angels in winter; cycling and swimming in lakes in summer. Growing up with only brothers and having only sons, it’s crucial for me to connect with other women whenever and however I can. I am a traveller, a putterer in the garden, a hostess of fabulous dinner parties and a member of the best book club ever.